Outdoor advertising near roads is nothing new, but digital signage has long been restricted from motorways in NSW, Australia. Citing them as a distraction to drivers, the NSW government has banned ads with moving or video images within sight of roads. However, ongoing debate between ad companies and the state government over recent weeks could lead to significant changes to these rules. According to the Outdoor Media Association, Queensland has already begun testing new digital outdoor platforms and NSW is close to following in its footsteps. Research conducted by independent outdoor operator Octopus in Victoria highlighted that digital signs do not lead to an increase in accidents. 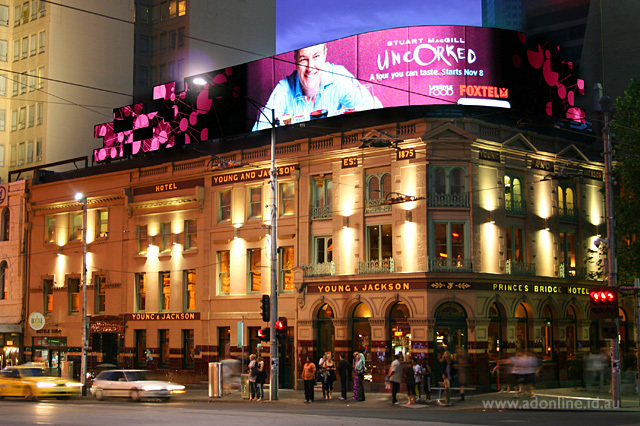 Victoria is currently the only state featuring dynamic digital advertising near roads, including a massive digital structure on the top of Melbourne’s famed Young & Jackson’s Hotel. The Australian media landscape has become increasingly fragmented and consumers are more difficult to reach than ever before, leading many advertisers to turn to digital signage solutions (also called Digital-Out-Of-Home (DOOH) media) to capture the attention of consumers who are switching off from traditional ways of engaging. As one of the fastest growing marketing and communications sectors, digital signage solves many of the problems plaguing traditional media, including declining national audiences, technology allowing consumers to skip or avoid ads and the shift in consumer attention to alternative media. The OMA industry body is drafting new digital advertising guidelines it is hoping to see adopted in NSW over the coming months.